Scrolling through Pinterest lately, I was struck by how different two presentations can make one gown look. 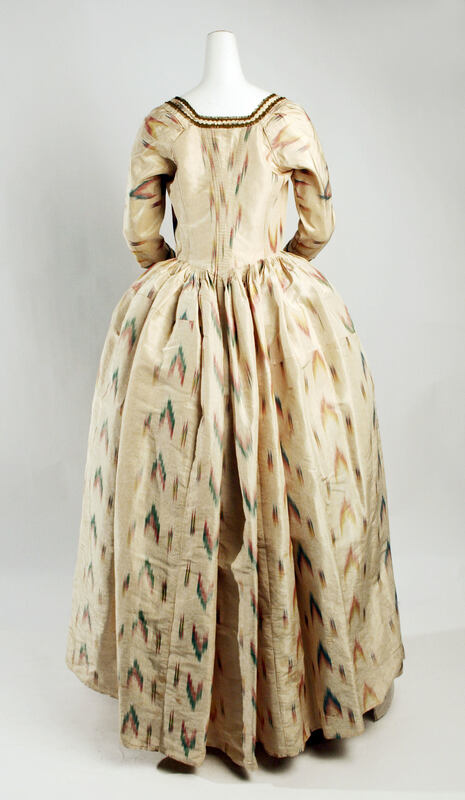 Above, a lovely Ikat-type silk gown with en fourreau back and trim, center front closing and probably a little closer to 1778 or 1780 than 1775. It’s presented on a mannequin that supports the gown for photography and allows us to see it clearly, from the trim at the neck to the pleats down the back and the pleasant fullness of the skirt. The gown is shown, we get the details. And then, in another image, another view. 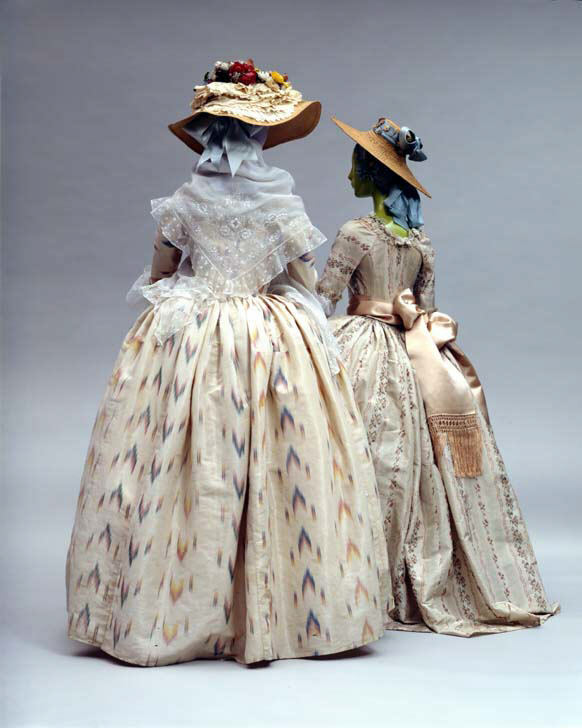 In this image, the gown (and its companion) have been styled and accessorized, fichus, hats, ribbons, sashes. The skirt is more fully and completely supported, showing off the silk to even better effect. We lose the trim and pleating details, but the gown is much more attractive in this view. This is not meant to criticize the images or the handling of the costumes, but to point out that you have to look past the plain record shots in museum databases, and see the gown as it would have been worn. Working with database images, and re-creating garments from those images, requires a leap of imagination. The more you look (at database photos, exhibition photos, extant garments, fashion plates, other re-creations) the better you will be able to imagine the garment as it might have been, and to make it yourself. To be fair, original garments cannot always be mounted in stylish and appropriate fashion, but they can still tell us something. The more you look, the more you’ll see.